The Personal Envoy of the UN Secretary General for the Sahara, Christopher Ross, who is currently on a new North African tour, held talks Wednesday afternoon in Rabat with Moroccan Foreign Minister, Salaheddine Mezouar. The contents of talks were not disclosed. Yet, informed sources said the UN mediator was carrying no new idea or new proposal. As he usually does, he just takes note of the suggestions and remarks made by his interlocutors whether in Algiers, Rabat or elsewhere. According to the same source, Salaheddine Mezouar seized the opportunity to reiterate Morocco’s standpoint as it was clearly stated again by King Mohammed VI in the speech he delivered on the occasion of the 40th anniversary of the Green March, November 6, namely that autonomy is the maximum concession that Morocco can make. As the Western Sahara issue has been in an impasse for several years and as the United Nations and its emissaries proved unable to make things progress, Morocco made it clear that it refuses to wait forever for a political solution that is not coming. 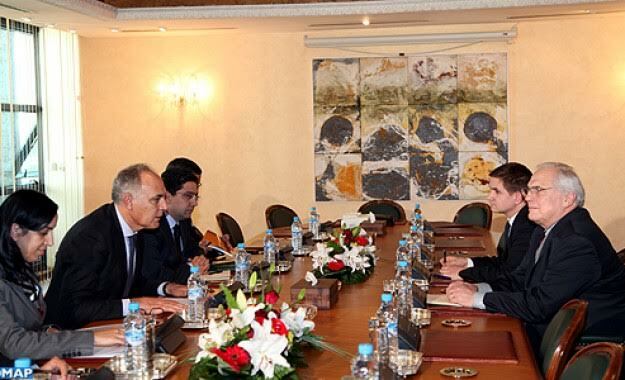 It is in this context that during his latest visit to Laayoune earlier this month, the sovereign kicked off the advanced regionalization process which is being implemented in its first phase in the three regions of Dakhla, Laayoune and Guelmime. During his visit to Laayoune, King Mohammed VI launched a number of major socio-economic projects requiring a total investment of 77 billion DH. These new projects are part of the new development strategy for the Kingdom’s southern provinces. For Rabat authorities, this is the appropriate response to the intransigence of Algerian rulers and Polisario leaders. They both stick to the obsolete option of a self-determination referendum and reject specialized UN agencies’ requests to conduct a census of the Tindouf camps populations. Observers note that even the UN has its hands tied in front of the intransigence of the Algerian and the Polisario leaders.